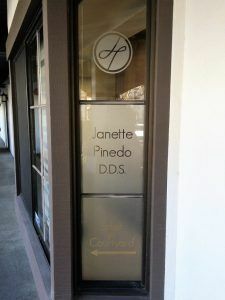 Vinyl is an affordable alternative to more permanent signage like building or lobby signs and it is also very versatile. Vinyl already comes in many different colors and opacities but we can even digitally print any color, pattern, or logo onto the vinyl. We can cut any lettering or shape out of it so it is perfect for your customized signage. 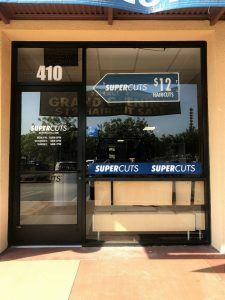 A very common advertising strategy that businesses use is utilizing their front windows or doors by displaying vinyl graphics. 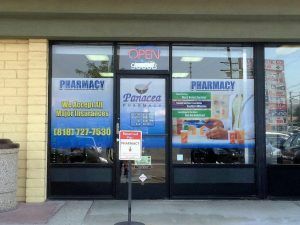 It’s very common to see all glass storefronts and it’s smart to use that space to your advantage. Even within vinyl, there are many different types. Here are the most common window vinyl jobs that we do for customers. We use perforated window vinyl on a lot of vehicle windows so they can use as much of their advertising space as they can without obstructing their view while driving. This same vinyl can also be used on storefront windows to display large graphics and a lot of information while still being able to see outside. We can cover your entire window with and digitally print any information you want with a limitless option of colors. For a recent job, we replaced some vinyl lettering for our long-time customer, Santa Monica Pet Medical Center. We originally did a few different signs for them in 2010 that included window graphics. We have since replaced the graphics pretty frequently with updated information. Most recently we removed and replaced all of the vinyl to make some name changes. For window graphics like this, we usually cut out letters from white vinyl. We use white vinyl because it stands out best on different backgrounds and the windows we are applying the vinyl to is usually clear so what is behind the lettering is always changing. We can also digitally print any image onto vinyl and contour cut the shape out to be applied to your windows. With this, you can display your logo or an image that shows what your business offers. When etched vinyl is applied onto a clear surface like glass or acrylic, it gives the impression that the surface has been professionally treated. You can get a frosted glass effect for a fraction of the cost. We can cut shapes or letters from the vinyl, out of the vinyl, or cover all or part of the glass to create privacy in a room in an elegant way.